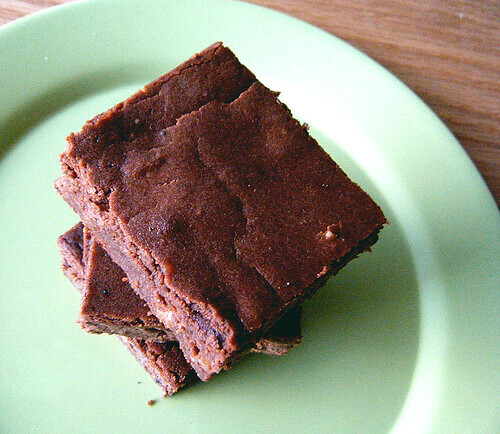 74 Comments on Coconut Flour Brownies, revisited–Gluten-free and Delicious! Yum. I recently got a hold of Kerrygold butter from Trader Joe’s for $2.69/half pound. It is so delicious. Reminds me of when I was in Ireland. Lauren, I am wondering if you have issues with erythritol. Not digestive issues, but a feeling of thirst from eating it. I have tried it and find that I feel very thirsty when I eat eryhtritol-sweetened treats. These sound amazing. I love that you added cream cheese. Clever:) I can’t wait to try them…and not change anything! I’m into coconut flour too lately. If I were to use agave syrup or maple syrup instead of the sweeteners you use, which quantity would you suggest? Wow, it’s a dairy extravaganza! These look amazing! Do you have any suggestions for dairy free or low fat? bless your cotton socks, lauren! I’ve been dying for brownies! Wow, those do look great, Lauren! It looks really fudgy and yummy! I am glad that you are posting coconut flour recipes – I have some but wasn’t sure what to do with it all! Now 2 good recipes to try! Shannon, so glad someone else shares the Kerrygold love! I do not have issues with erythritol unless I have multiple servings in one sitting, which I don’t tend to do. 🙂 Have not experienced the thirst, but I’ll make of note of it next time I eat something with E! Thanks for sharing your experience. Synesthetic, you are so welcome! It’s so nice to see YOU leave a comment here. 😀 Hope you like the brownies! Alchemille, I’d try 1/2 cup, but I’m not familiar with that sweetener so it’s just a guess. Try tasting the batter as you go along! Meagan, I’m working on it! 😉 Will share results if they work out. Ms. V, what a cute comment! I made these last night…. had one today for Breakfast…. they are amazing! A definate keeper! do you know if coconut powder is the same as coconut flour? cus thats all i can find in my rubbish country! Made these today, more for DH and MIL since I'm not a huge brownie fan. They both liked them and I thought they were pretty authentic. I'm not in love with them, no surprise, but I plan to make them for DH and freeze them individually so he has his sweet treats. And I won't be driven to consume them to excess like I do every other one of your recipes! So anyway, thanks for this one! Anne – You are welcome! Happy to hear these worked, even with that dark cocoa. Hope your weekend went well! Divalou – I am not sure what coconut powder is! As long as it is defatted ground coconut, it will work similarly. If it is just ground up, it won't work the same in recipes! I made these! The first GL/SF recipe I've tried. They are good, but not what I expected. Mine didn't seem chocolately enough. I could still taste the coconut "essense" from the flour. I think I need to use a better cocoa. I just used plain Hershey's unsweetened cocoa cause it's what I had on hand. Also, mine didn't really end up that dense. Mine are pretty light and more cakey. I used a 9×13 pan for approx 30 minutes and I ended up leaving out the nuts. Perhaps one of those factors had something to do with it! Keri-Ann – So glad you and your family enjoyed the brownies! Putting the cream cheese frosting on top sounds fantastic. Kayla – Did you spoon the cocoa straight from the container, so that the spoonfuls were pretty packed in? Did you lightly spoon SIFTED coconut flour into a measure cup, and level the top with a knife? These are not even close to being cakey–they're brick-like and heavy, quite dense. Perhaps it's the larger pan you used? What kind of coconut flour? If you used all the same ingredients, that may have been a factor. I also couldn't really tell whether these were to be cooked on 350 or 325. You say to preheat to 350, but to cook at 325. And the original recipe says 350. I was confused! I sifted the flour and packed the cocoa like a good girl (I'm such a lazy baker)…and I got dense fudgy brownies! Thanks Lauren! Even the cakey ones were great, though. although i love them, mine were also pretty cakey. i was loving the smell of the dry ingredients together, and decided to add a great amount of cinnamon. esp with the added cinnamon, the flavor of the brownies was remarkable, but the texture somewhat of an issue. i tried them a second time using ricotta instead of cream cheese, and adding a handful of dark chocolate chips with the nuts. this provided a more "conventional" fudge like texture, but both ways were really tasty. Mine turned out cakey, too. I did sift the coconut flour, and spooned the cocoa out of the container. WIll leaving them in the oven a couple minutes too long make them cakey? My timer went off and I couldn't get to the oven in time. I will try again, I so want dense, fudgey brownies. Is there a way to make these with chocolate chips instead of the nuts? Hey! I made these and they are AWESOME!!! My husband loves them, which is saying a lot because he is usually so-so about my low-carb creations. Nice going! Lynn, you can definitely replace the nuts with chips! Enjoy! Amber, I am SO glad you like the brownies. They are my favorite chocolate treat! Mine came out extremely dry – I couldn't even pour the batter into the pan! I wonder if it's the sweetener I used? It's called Sweet Simplicity and is a dry erythritol/fructose mix. These are so incredibly delicious! I reheat them in the microwave for a few seconds and then add a half scoop of low carb ice cream. Unbelievable good! Of course, they are also high calorie though. Any recommendations for lowering the calorie count? Has anyone tried substituting applesauce for some of the butter? I know applesauce will add carbs, but not many. i finally made these, after making the bean cake and simple cocoa brownies multiple times. all i can say is "WOWWW"!! so freakin good. I am a big fan of your site and I have to say that most of your recipes have already been tested on me! But coconut? I'd better pass this time. Do you think I could add chocolate chips to this? Really your are simply great….. I have found awesome recipes from your blog, Really all these recipes were delicious. Thanks for the share and keep posting such an amazing recipes…. I'm looking forward to your new posts. I have been an avid follower of your site. I want healthy treats but am also on a diet (two kids . . . ). Most diet food tends to be synthetic/plastic, so I have re-vamped your brownie recipe to reduce the calories (although these are probably the most expensive brownies I have made in my life!). 1/3 cup unsweetened cocoa powder (I used raw cacao – sweet and very healthy). 1/4 cup brown sugar – substituted quarter cup erythritol with 1 teaspoon of Yacon syrup, blended together (Yacon is 29 cals oer tsp). I baked at 350 for 40 minutes. It is pretty dense. I am wondering if there is any low-cal way to lighten it up a bit, but, in any case, it is pretty darn good (but no, it will never be a real brownie!). Made these the other day. SO GOOD! Even the non-low carbing husband liked them. Thanks so much for your recipes, I can't think up enough fawning adjectives to get my true appreciation and gratitude across for such delicious low carb recipes that work! I have tried this receipe at home & it works. Thanks for such a nice receipe. Keep sharing your receipies. I just made these, they're in the oven as I'm typing this. I'm a little concerned because my "batter" was the consistency of cookie dough. I had to laugh when I read the instruction to pour it into my pan. I'm wondering if my coconut flour was somehow more "thirsty"? They look a little strange in the oven right now. I will be interested to see how they turn out. Hi, Sarah! Did you use Bob's Red Mill coconut flour? I find that it's the only brand that's been working in my recipes. I amended the recipe to show this. How'd the brownies turn out? Thanks so much! I've made them twice now – once per the recipe (used all butter/no sour cream), once with sour cream and 1/4 cup strong espresso – it really added some depth to the chocolate flavor. Definitely a keeper – the kids love them too! The coconut I have is Coconut Secret. It's listed at 8 grams carbs, 8 grams dietary fiber. So I was drawn to it for it's low carb count. My brownies actually turned out okay, but not very brownie like. I have been eating them though, so they're not exactly disgusting:) They're more like a dry fudge texture. I would like to try the recipe again with about half the amount of coconut flour that I have to see if that makes them more like your recipe. I have no doubt that the issue was my coconut flour and not the recipe. I usually buy Bob's Red Mill, but Whole Foods was out so I thought I'd give this brand a whirl. I live in Portland and should really just go to the Bob's Red Mill outlet that's connected to their manufacturing facility. That place is awesome. hi , I'm new to low carb lifestyle and I'm still unsure of various ingredients. Could you confirm whether the Stevia extract is in liquid or powder form, are all powder forms the same concentration of sweetness? I can't wait to try the recipe! I started to make this recipe, but had to make some emergency "adjustments" when I realized I had no cream and the whole milk was sour. I used 8 ounces of cream cheese, 3/4 cup Torani's sugar-free Irish Cream syrup (my dad's a diabetic so no honey). I used 1/2 teaspoon of Truvia, 1/3 cup of skim milk and added 1 Tablespoon of instant coffee granules and a few shakes of cinnamon. The batter was too thick, so I added a little Torani's sugar-free Hazelnut and more skim milk until it was wetter. I divided mine into 16 muffins (muffins make it really easy for me to calculate carbs for my dad). I baked for 20 minutes at 350 (until the knife came out clean). These are great! They have an airy, mousse-like texture. I'm glad I used the paper muffin cups, b/c I doubt I would have gotten them out of the muffin tins otherwise. They taste a lot like an Almond Joy or Mounds bar, but less sweet, with a definite coffee note. I will come back tomorrow to share how my dad likes them and how they taste the next day. Mine turned out great. They turned out milk chocolatey–yum! I used Bob's Red Mill coconut flour, sifted then spooned. The erythritol didn't have a cooling effect. I actually used a 8×8 pan and baked 5 minutes less than the recommended time because I was afraid of dried out brownies. They turned out moist! I also used Trader Joe's organic stevia extract and they did not taste bitter at all. Highly recommended! I'm the person who made the "mousse-like" muffins. Day 2, these were even better. The flavor softened and became richer. My dad really likes them. He's a chocolate fiend, so I'm on the lookout for chocolate recipes he can eat. As soon as these are gone, I'll be making your bean chocolate cake. I made these late last night, I just had to try them out! And the results? Oh my goodness… they are fantastic! I didn't have any sour cream in the fridge but I had some creme fraiche which I used instead. I also didn't have pecans or walnuts on hand so I left them out. Thanks for the recipe! I will be feeding them to my boyfriends family for dessert tonight (If I don't eat the rest all by myself this morning)to prove to them that healthy eating can be delicious! I'm working at achieving this mindset as they all think I'm a crazy extremist and that life can't be lived without sugar. So happy you enjoyed the brownies, Jenni! Love your recipes! Thanks so much. Tried these and they were very good. Not sure if it fits in with the diet, but I found upping the sour cream a little (2oz), doing half coconut flour half almond meal (instead of all coconute flour)and using coconut sugar for the sweetener instead of xylitol worked really well. I think they taste totally like the real deal. Thanks! Hi Lauren. I've made these twice now and they are the most popular diabetic treat I turn out! Thanks so much for the recipe. The one thing I am unclear about is the erythritol. The stuff I have is erythritol POWDER (from Netrition) and I'm guessing, having now read another of your recipes in which you call for powdering erythritol in a blender, that this is not what you meant for this recipe. What I made was delicious. But it seems they would probably be sweeter if I made it with your plain erythritol? I wish someone had a conversion chart between erythritol and erythritol powder, because, for instance, I'd like to make your beany chocolate cake but it isn't clear how much powder is called for. My brownies are in the oven as we speak, but I was wondering how you figure the carbs? My number doesn't come out the same. I'm still kind of new to this. My 4 1/2yr old daughter was diagnosed with type 1 diabetes in Dec. so we are trying to find desert type recipes. We LOVE the black bean cupcakes! They are amazing! lilmsabby – I exclude carbs from erythritol and measure the coconut flour carbs using the weight of the coconut flour, which is wrong on the Bob's Red Mill package. That might be how your carb count comes out differently. Hope your daughter enjoyed the bronwies! I just tried to work out the carbs for my batch and on myfitnesspal entered the whole ingrediant list and it came out as 328 cals per 1/12th – 28g carbs 5g fiber and 30g fat!! PER 1/12?!!!! – the Wholesome Sweeteners – Organic Zero Erythritol was 205g carbs – i thought it was meant to be a low carb sweetener? Could you help me with trying to get my head around erythritol and carb contents please?!!! I can’t eat these until cheat day now 🙁 I had to use mum’s original coconut flour too – i know you said the bob’s red is wrong on the packet so i cant even use that excuse!!! Hi Sarah, I am in Portland too, but never been to Bob’s outlet, is it cheaper? Lauren, thanks for posting this. Is it OK to use other brand coconut flours or no? Also, I saw at my local grocery store coconut powder in the bulk foods but no sure it was flour? I don’t recall what it said, it maybe just said coconut but it wasn’t flakes, looked like powder. Not sure if it will work whatever it was? Also do you find that this is the best alternative flour to use? Are any others low carb? Perhaps tapioca? I read that potatoe and rice are not low carb. I bet oat flour is high in carbs? Almond flour isn’t though, need to figure out where to buy these things for a good price. OK I have another question. For the brownies you use coconut flour, but isn’t that super sweet thus adding to the simple carbs and also making the desert too sweet or no? Also, for your cheesecake bar crust, you use oat flour and almond flour combined. What does the combo do that alone doesn’t work and what made you choose this combo here and the coconut flour for the brownies? I know I can just follow a recipe, but I love learning how things work together and why this will be done over that. I hope to continue learning from you, thank you! Hi! I came across your website while scouring for interesting recipes to try, as I’ve started eating Atkins-style. I made these brownies last night and ended up having several bites for breakfast, as you said… so delicious. I didn’t have cream cheese, so I used 1.5 sticks butter + 3/4 cup sour cream, and the rest of the recipe was followed exactly. I like how soft and melty they are. I’ve had some very dry, dense, disappointing brownies before, and this recipe saved me from skepticism about grain-free baking. So, thank you! I will certainly be cautious with servings, as these are quite decadent! I will also hopefully try more of your recipes to keep my menu interesting. Thanks again. Alison, glad to hear you enjoyed the brownies. They are quite rich! Please try my grain-free zucchini bread if you are looking for more chocolaty grain-free treats. 🙂 Thanks for your review of the brownies! Thank you so much, recipe was tasty, just great! I used the butter plus sour cream version, brownies were moisty. Erythritol had zero after taste. Will bake regularly. Calories per 1/12th? Thx. Well I made your original recipe – the one that many people had problems with, and I loved it! They are fabulous! I put them into the water bath at 20 minutes and they were done just right. They’ll never be the same as the gluten kind, but these are by far the best sugar and gluten free dessert I’ve ever had. Had a hard time not eating the whole pan at once. I’m really glad to have found your website because it has given me a different choice from buying expensive low-carb dessert mixes online. Thanks for all the wonderful recipes! Noelle, I’m so glad to hear that you enjoyed the original brownie recipe that was posted! Happy that it satisfied your sweet tooth. Thanks for sharing your experience with it! Noelle, it’s great to hear that you enjoyed my original brownie recipe! I’m so glad you can make use of my recipes to satisfy your sweet tooth. Thank you for sharing your experiences with them, Noelle! I love hearing your feedback. SIX YEARS late to the party, but these are fabulous. I had my doubts about anything baked low-carb = edible, but these are great, nice and fudgy. I’m really looking forward to trying your recipe, but I just have one question about the heavy cream used. Is it heavy cream, or heavy whipping cream ? Not sure if there was a difference between the two. Thanks !